Can you believe it? The frigid winter months are finally behind us (for the most part at least), and our winter gear is going right with it. Spring is always my favorite time of the year. The days grow longer; the birds come back home filling our ears with springtime melodies. And it’s only a matter of time before the neighborhood starts to be filled with the familiar barbecue aroma’s I miss so much during the winter months. Nothing beats springtime. There is at least one drawback of the changing weather though. Longer days seem to coincide with kids becoming overly rambunctious directly; they exude energy and drive us absolutely insane in the process. Which is, precisely, why you should think about getting them an outdoor playset. Something to consume all of their energy during the daylight hours, so that you can have some peace and quiet when nightfall comes. INCLUDES FORT PLAY. A backyard metal swing set with a built-in playhouse. Great for hide-and-seek and role play. ROCK CLIMBING WALL. Kids will love the challenge of climbing to the top of this outdoor playset. HIGH QUALITY. A swing built using heavy duty components, bolts, and accessories meant for years of backyard fun. LOTS OF PLAY FEATURES. Metal playset includes: swing set with 2 swings, web swing, kids slide, climbing ladder, steering wheel, rock wall, tic-tac-toe game table, overhead shade canopy. Nothing beats a metal outdoor playsets. They are durable, sturdy, can hold a ton of weight and they have a bunch of things to do on them. 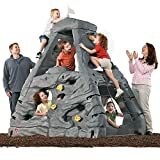 This playset includes a rock climbing wall, a fort, two traditional swings, a web swing, a slide, ladder, steering wheel, tic-tac-toe game table, and an overhead canopy for those times where you just need some shade (well your kids anyway). Safety is always a key feature for parents, and the Backyard Discovery is built with that in mind. These guys have over 30 years of outdoor playset building experience and put every ounce of effort into making their products both fun and safe for the kids. Rest at ease parents; your little tykes will be perfectly safe here. If you have a gang of children, then you simply have to have a playset that can support all of them. The only thing worse than a group of children playing inside is a group of children fighting over toys. The Cedar Summit puts all of that annoying kid bickering to rest. This hefty playset is constructed of 100%… you guessed it… cedar wood, making it the best wooden playset that money can buy. It is about as sturdy as you can ask a playset to be too, capable of holding up to 10 kids at once. And if you’re looking for versatility; you would be hard-pressed to find anything more versatile than this beastly set, because it isn’t just made for the big kids. The tots can get in on the action too. From swinging to rock climbing to sliding and it even has a clubhouse at the bottom of it. There is something for every kid to enjoy, and they won’t have to fight over anything either (except they’re kids… so they’ll fight anyway). 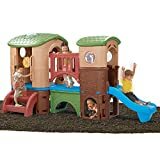 If you’re looking for backyard playsets for toddlers, the Clubhouse Climber is where you should start first. 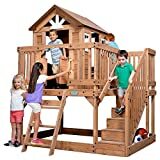 Step2 outdoor playsets are always among the top-selling outdoor playsets, and the Clubhouse climber, just, might be the best product with the Step2 stamp on it. This playset is geared towards smaller children with an acceptable age range of 2 – 6 years old but we aren’t sure that’s what it should be rated for (more on that later). It features two play sections (both of which have their own slides), a captain’s wheel for the tots who want to “steer” the ship, and a viewing porthole so they can steer the boat out of danger. Cross the bridge from the captain’s cockpit, and they’ll make their way to the look-out tower to spot the pirates emerging over the horizon. They’ve even got a hideaway under the tunnel so they can hide from pirates too! What’s most important to kids is how much fun they can have on this outdoor playset. What’s most important to parents is that they’ll be safe on the playset. Step2 has you, covered mom, all of the safety precautions have been taken to make sure your babies will be out of harm’s way. There is no limit to the amount of fun your kids can have on the Step2 Clubhouse Climber, especially with a little imagination. Heck, you may even want to get in on some of the fun. This is perfect for you rock climber out there who want to introduce your children to climbing. Remember when you were a kid and wanted to climb trees all the time? Most homes today (at least in my area) don’t have any trees climb. Well, Step2 has your solution with what is hands down the best climbing playsets out there. Your kids will have a blast on this thing, and they are sure to be tuckered out by the end of their play session. It’s a win-win for everyone involved. Step2 deserves an award for that. It has four uniquely designed climbing surfaces offering different levels of challenges for toddlers to overcome (every parent loves seeing their babies overcome obstacles). There are two cargo nets, a floor, and nine hand/foot grips for children to climb on. The best part is the lookout hole your master climber can PEAK through once he reaches the summit. Strength and durability is a premium quality when it comes to plastic outdoor playsets. And the Skyward Summit definitely delivers in that department. It can hold four children at a time with a combined maximum weight limit of 320-pounds. But still, we highly recommend you supervise play time on this. This is one of our favorites, not just because it has so many activities for your kids and their friends to do on it. But also because it is more spread out. It isn’t as large as some of the other playsets on our list. But the people over at Swing-N-Slide really know how to maximize space. The options for your children are endless here. From climbing up the net on one side of the playset and climbing back down on the other side, to climbing the rock wall up to the fort that leads to the slide. Of course, being a Swing-N-Slide, it also has some swings on there too (three to be exact). There is no doubt that your kids will enjoy themselves in this outdoor playset. So what is included? Well aside from the things we already mentioned, you’ll also find monkey bars and a regular climbing ladder. Oh, and how could we forget, the 2-piece slide has a lifetime warranty against cracks and breaks, which pretty much a godsend for people who live in areas where the temperatures routinely reach the triple digits. Overall, this is an outdoor swing set that will not disappoint (that goes for both kids and parents), so it is one you should seriously consider if you are looking for a midsize swing set. Sure, the big swing set is going to be the main attraction in your backyard. And with the amount of money you’re going to be spending on it (or maybe already have) it should be. But eventually, kids are going to want something else to play on for a while right? Now you have two choices; they come back inside (NOOO!!! ), or you find them something else to do. I’d go with the second choice. That is where climbing playsets come into play. We’ve discussed one earlier (and we do love that one still), but this set is geared more towards the older kids. 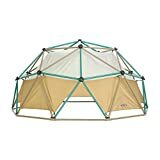 The Geometric Dome Climber is a whopping 10-feet in diameter and 5-feet in height, so it gives kids plenty of space to work with. It has a strong, sturdy design constructed with high-density polyethylene climbing grips. That means, not only will the jungle gym hold up to a lot of weight, but the kids playing on it will have an excellent grip on it. While jungle gyms like this one are typically thought of as being for older children, Lifetime bills this product as being suitable for ages between 3 and 10. Although trust us when we say, grown-ups can get on this too. Its total weight capacity is 600-pounds. I don’t think you’ll ever find enough kids to break this thing. Its durability is astounding. Sometimes we are looking for a more temporary solution for an outdoor playset. Other times we don’t need for one of those giant playsets that cost upwards of a thousand dollars and takes four people 20 hours to put together. 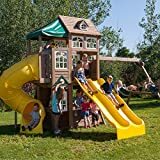 Those moments call for something more simple, and if you are looking for cheap outdoor playsets, then you have found what you are looking for. This metal A-frame swing set for Movement God is an excellent alternative to the giant swing sets that we have reviewed so far. It has three swings, two traditional swings and one of those teeter-totter swings that we all loved so much growing up. Making this able to hold up to four people at a given time. This set features metal poles that are UV-resistant helping it to retain its strength and maintain its color. It is all-weather resistant so it won’t crack, warp, splinter, or rot. But if it does, you’ll also be getting a five-year warranty on this swing set. The acceptable age range for this swing set is from three years to eight years old. But to be honest, I wouldn’t feel comfortable putting multiple eight-year-olds on it together. Because it is a free-standing swing set, there is no ground anchored, and the momentum of multiple 8-year olds is likely going to tip it over. That isn’t to say this isn’t a safe swing set (we wouldn’t recommend it if it weren’t) just that you should be careful about how many kids are on it at once. 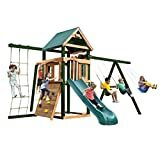 Overall, this is a great option for somebody who is looking to purchase an inexpensive swing set for one or two children to play on at a time. If you love sports, you probably want your young’n to love sports too right? I know I do! If this is a category you fall into, then you are going to love this playset. I know what you are thinking, “again with a Step2 product”. But these guys are an industry leader in outdoor playsets. Their products are just always top-notch. And the idea of putting a basketball hoop with a slide is something everybody can get behind. 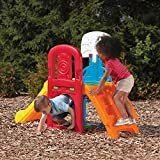 The Game Time Sports Climber and Slide might be small and simple in design, but it offers plenty of things for the youngest of children to do. After all, this is made with one and two-year-old children in mind. The most obvious things your child can do on this is shoot baskets and go down the slide. But as parents know all too well, kids never do the most obvious thing. What we see most is kids crawling under the bridge and through the tunnel, when they are first getting used to it. But once your tot does graduate to shooting baskets with this sweet outdoor playset for one-year-olds. They’ll be learning how to count too because the basket has a scorekeeper so they can track how many shots they made. Of course, it has a ladder (that is where the “climber” comes into play) leading up to the slide. And the tunnel that is under the ladder and slide is really a goal for the included ball. Young kids are sure to love them, and the parents are sure to love watching them interact with their new toy. Do you want an idea of how to incorporate this into your kid’s other toys? You can put this slide porting into a ball pit to create your child’s very own Chuck-e-cheese playhouse. It is the perfect solution for DIY outdoor playsets. One-year-olds aren’t able to climb yet, but they love going down the slide. When you are looking for outdoor playsets of one-year-olds, it is always difficult to find something that you think will fit your needs. One-year-olds can barely walk. But this Little Tikes Hide and Seek Climber is sure to be a big hit. Not only is she going to be able to climb the small rock wall (albeit not with ease at first) but she is going to love the slide. For the babies that would rather crawl, than climb, there is something for them too. The tunnel under the bridge connecting the rock wall and slide is always a big hit the little ones. They love the feeling of being in enclosed spaces. The slide height is 19.75-inches; the perfect height for 1 and two-year-olds because they aren’t scared to go down, but the slide is still high enough to be fun. The slope at the end of the slide is nice too because it creates soft landings for them. A 12.50-inch tall climbing wall is easy to get up, and the wall is wide enough to let help your baby keep his balance when going up it. All in all, this is a super buy if you are looking for an outdoor playhouse for one-year-olds. We are confident you won’t be disappointed with this purchase. Especially when you see the pure joy on your babies face as she plays with it. 5' growth board for tracking years of Playset fun! 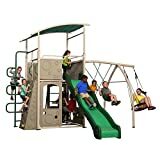 Now, this isn’t a swing set, rock climbing, slide combination like so many other outdoor playsets on our list. But that doesn’t make it any less awesome; in fact, this is one of the playsets that younger children seem to like the most. Have you ever wanted a tree house, but either didn’t have space, the trees, or the money to get one? I know I have, I remember collecting coupons in the grocery stores so I could stock up on Uncrustables once I built my tree house. But that never happened. But with this playhouse, your child will never have to know the pain of having 20 dollars in coupons savings that she can never use. Sure it won’t be a treehouse, but that’s only because it is better than a tree house. The Scenic Heights house has a raised three-foot deck making your little guy or gal feel like the king or queen of the world that they are destined to become one day. There is even a saloon for them to pour themselves a shot of their favorite apple juice, and a kitchen for them to make themselves a bowl of their favorite applesauce. Basically, this playhouse is awesome. Durability is a necessity when you are spending a hefty chunk of change on anything. And this is especially true when it is something that stays outside and houses your kids throughout the day. Thankfully, Backyard Discovery takes this just as seriously as parents do. They used the strongest of cedar wood to make sure that this lasts a long as you want it to last. Oh, and I almost forgot. It also has a wooden cot that fits a small mattress (that is included) for Sunday afternoon naps. They even went so far as to put two roll-out boxes under it for additional storage. Man this is a kids version of an adult tiny house. We all struggle a bit when trying to something for our beloved children, especially when it comes to those big purchases like kids outdoor playsets. As adults, we want to be sure that we are wise with our money, but as parents, we get to get the best playset that money can buy. Not to mention there are tons of questions that come with the territory of making such a large purchase. Should I get wood or metal playsets? Or maybe Plastic! How much money is too much? How much money is too little? I think you get the picture. Because of that most people go out to big box stores to get their outdoor playsets in the hopes that the sales reps there will have intimate knowledge of them. I’ll let you in on a secret… they don’t. Luckily, you don’t have to go out and get Home Depot outdoor playsets (no offense to them, I’m a huge Arthur Blank fan). Besides doing that will only mean you miss out on huge savings most of the time. Shopping for the best outdoor playset for your child doesn’t have to be hard. You just need to keep a few things in mind. This is probably a pretty well-known thing to most people. But the material that your swing set is made of will make a world of difference. But it isn’t just about whether it is made of wood, metal, or plastic. It is more important to ensure that regardless of the type of material it is made out of, it is quality material. Getting a wooden playset doesn’t automatically mean it is going to be durable. Particle board is technically wood, but nobody would confuse that as a durable material. And the same goes for metal. Just any metal won’t do for an outdoor swing set. It has to have waterproofing coating, so it doesn’t rust, it should be lightweight, and of course, it should bend when under pressure. The ideal would be to get every type of playset available, but that would likely cost a literal arm and leg. Try to figure out what your kids enjoy most at the parks. Some love slides, others (like myself) get bored with them easily. Do your kids like to swing and climb, or would they rather play in a fort? These are things that are commonly neglected when buying outdoor playsets, be sure to keep it in mind. Obviously, you are going to want to buy something that is durable and could last a long time if you needed it to. That isn’t what we mean when we say longevity though. Instead, we are asking you how long do you want this to be the outdoor playset of choice? Do you want something that is going to grow with your children? Or do you want something that you can get for now, while saving up for that few thousand dollar playsets you saw the other day? Or maybe you just want an outdoor playset for your daughters first birthday. Obviously, you won’t be spending thousands on that. These are all pretty simple points, but somehow we always seem to forget the simplest of things. If you keep this in mind, you’ll be just fine when shopping for your kid’s outdoor playset. The spring and summer months mandate that kids go outside and play. It’s just how life works. But you can’t expect them to go outside and do nothing all day. Finding them an awesome outdoor playset is going to keep them entertained and keep you sane throughout these next several months. So make sure you get something they’ll love to play on. The alternative is them playing in the house. All mothers hate the thought of that. Next articleIs Green Vaginal Discharge Always the Sure Sign of Trichomoniasis?